Here is the next installment in the “My Favorite Liesl + Co. Pattern” series. It’s where we ask Liesl + Co. fans to share a bit about their favorite Liesl + Co. pattern, telling us why they like it and to show off the multiple times they’ve made it. Today we have Sarah from Fabric Tragic. Here she is. Hello! 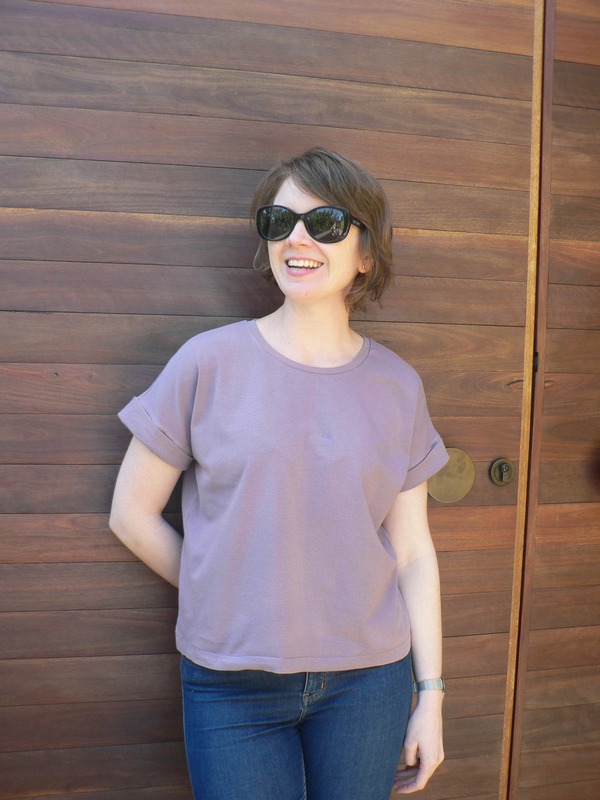 I’m Sarah and I blog my sewing projects over at Fabric Tragic. I’m a vet and live in Melbourne, Australia, with my husband and cat. I’ve been sewing for close to 30 years now, on and off, but garment sewing in earnest for about four years. Over time, and with a lot of practice, the vast majority of my wardrobe (both work and play) is self made. I love a fancy frock as much as any girl but daily wearable garments make up the bulk of my wardrobe and as such I love patterns that are simple, stylish and can be reinterpreted time and time again with consistently fantastic results. 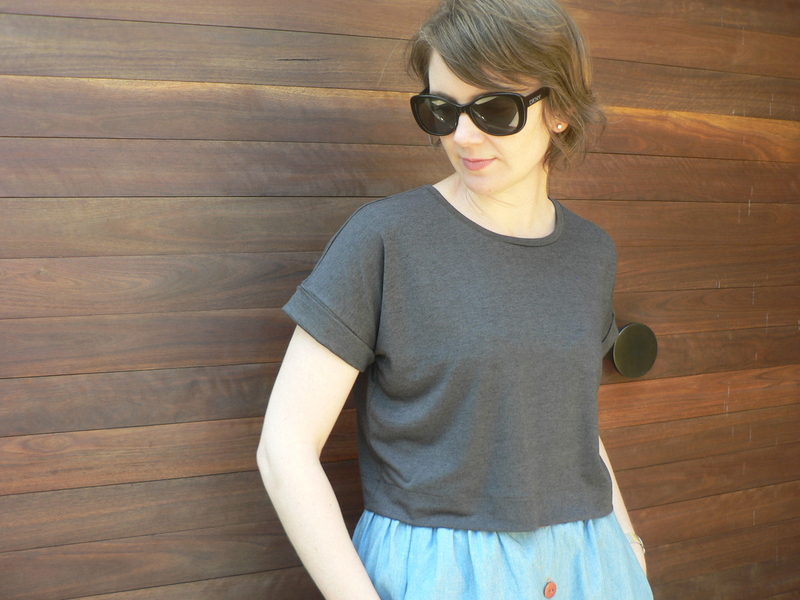 For me the Liesl + Co. Bento Tee has to be in my top five patterns of all time! I’ve made it close to 10 times now and it never lets me down. I first made my first Bento early last summer when I was focusing on orphan garments in my wardrobe–things I’d made and loved, but just hadn’t quite worked out the best way to wear or style them. I was experimenting with a bit of a change in style, looking for something that worked a little cropped but with some boxy volume. 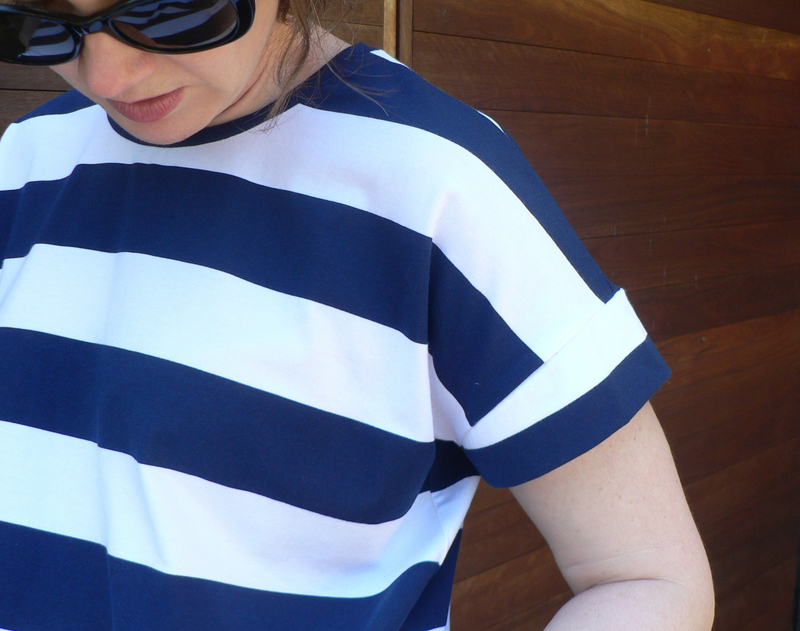 The Bento Tee looked perfect, and I loved the look of the little cuffs that finish the short sleeve version–elevating it to something a little more stylish than a basic tee. Bento 1 was made to check fit in a basic cotton lycra from my stash. I made no alterations and was so pleased with that first version that I wanted to wear it to work that day–I didn’t have time to hem it properly–so I glued it up, wore it and loved it (and of course I went back and stitched that hem properly down). 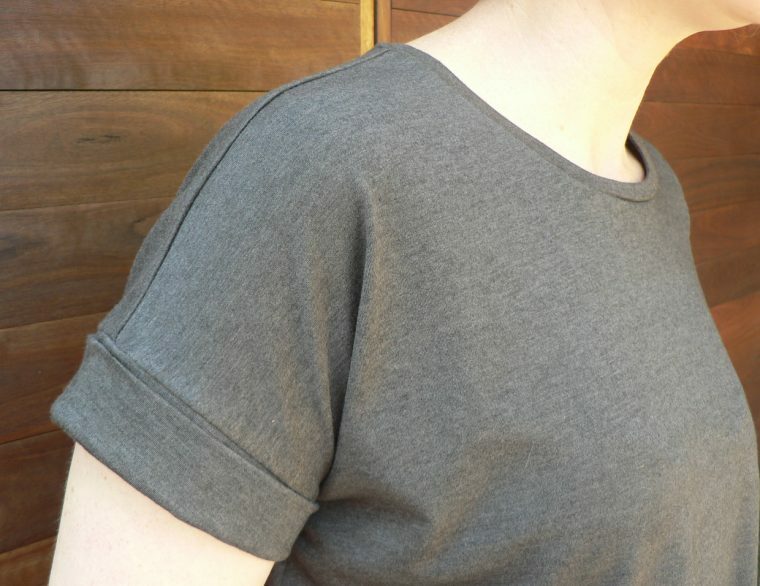 I’ve worn that tee a heap, but knew that my future versions would need a forward shoulder adjustment (FSA). You may need a FSA if you work a lot at a computer or have been a bit of a sloucher, or if you find tops fall backwards on your shoulders and get a bit choky at the neckline. A FSA is a really easy adjustment that makes the fit on tops so much more comfortable and makes them sit better. Google it and have a play, it might change your life! My next Bento was made in a much more drapey fabric, a viscose-lycra blend, and I started to play around with the length, making a cropped version to wear with some high-waisted gathered skirts. The drapier fabric changed the look slightly and I found that those fantastic cuffs needed a little more help to stay folded up. I have noticed with similar ready to wear styles that the cuffs are often tacked down with a few stitches a few times around the cuff. I think a button at the top of the shoulder would look really cute too! By now I knew I was hooked. I loved the fit. I knew full length or cropped worked, and the neckband went in perfectly without drama. And so began a little hacking. If you have followed my blog at all you’ll know that I love to meddle with a pattern, fiddling and altering and mashing to create my sartorial vision! 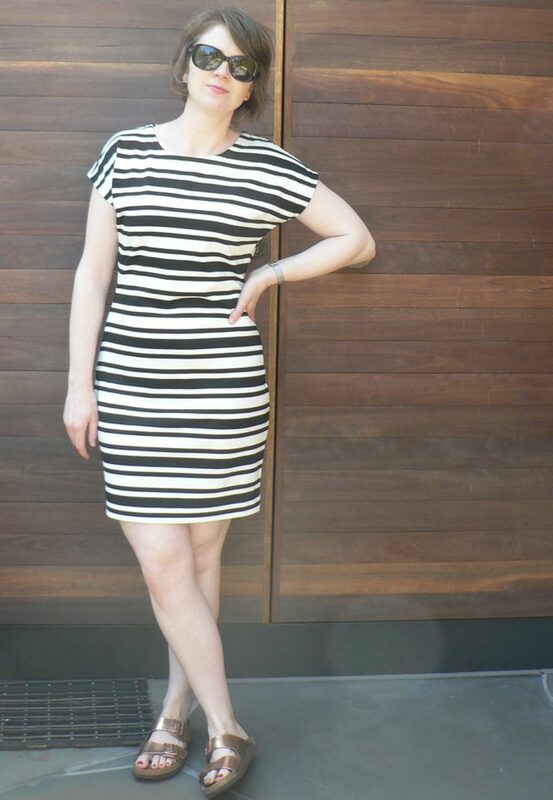 Version 3 involved a mashup with a fitted knit dress pattern using a fairly stable knit ponte. This time I left off the armbands, instead binding the sleeves, and drafted a facing that was topstitched down rather than using the neckband. 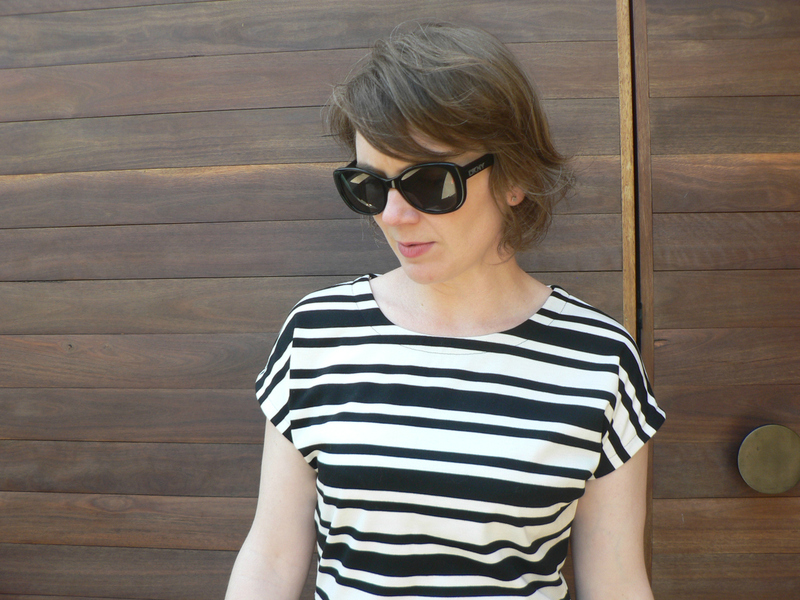 (I do love a top stitched facing–even in a knit. 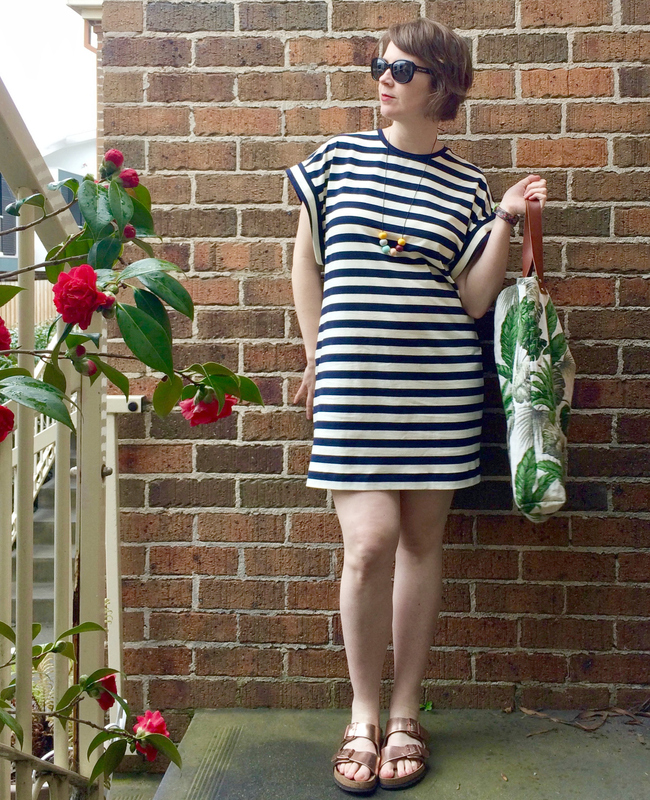 My first experience with this technique in a knit was with the Liesl + Co. Maritime Top which I also love and highly recommend!) 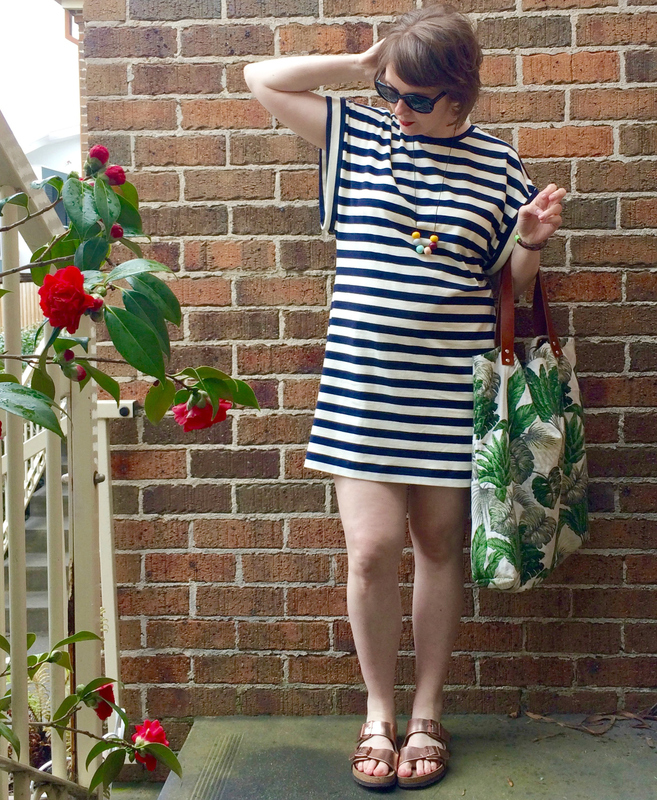 The mashup was a great success in terms of the look I was going for, but I overfitted the dress a little making it a bit hot for summer wear. Version 4 was made from another cotton-lycra blend and this time I decided to meddle with the cuff pieces. I was curious to see the finished look if I removed half of the width at the foldline, creating a cuff that didn’t need folding up but still having that lovely shape. I like it; it’s a good option to keep in mind in a very drapey fabric or if you are limited in fabric. I’ve a couple of more versions floating around, including more tees and a lovely warm long sleeved version in a merino that I’m yet to photograph but has been worn to death this winter. My most recent Bento variation, just finished this week, is a bit different. 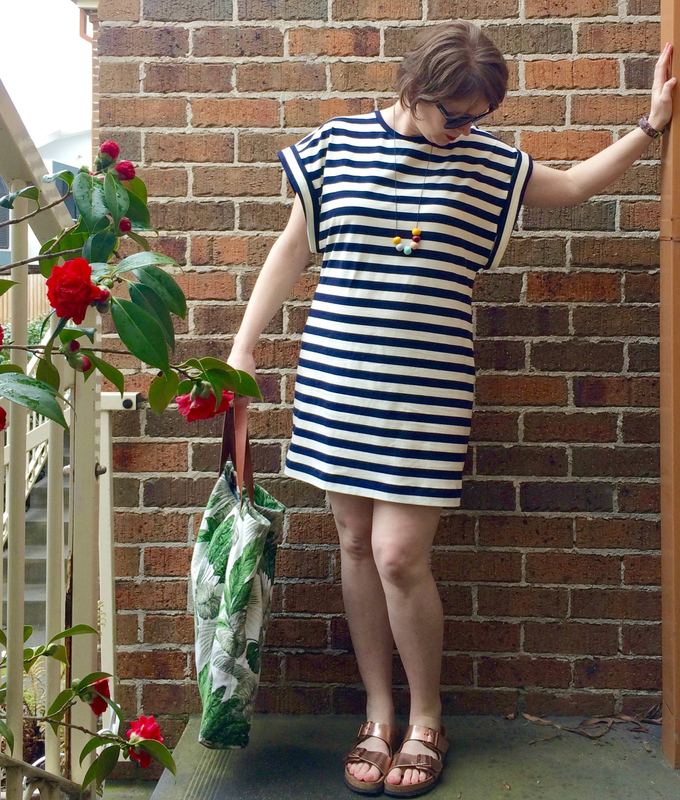 I’m 24 weeks pregnant at the time of writing and have been planning my post-baby nursing-friendly wardrobe. I’m due at the start of the Australian Summer but have a little tropical holiday planned in September and decided a full length relaxed fit Bento dress would be both bump friendly and, with a clever little sleeve hack inspired by another sewing blogger, nursing friendly down the track. Keeping my pre-pregnancy upper body size the same I added an extra 5/8 inch in width from the waist/hips down for some extra bump room and extended length to reach my knees. 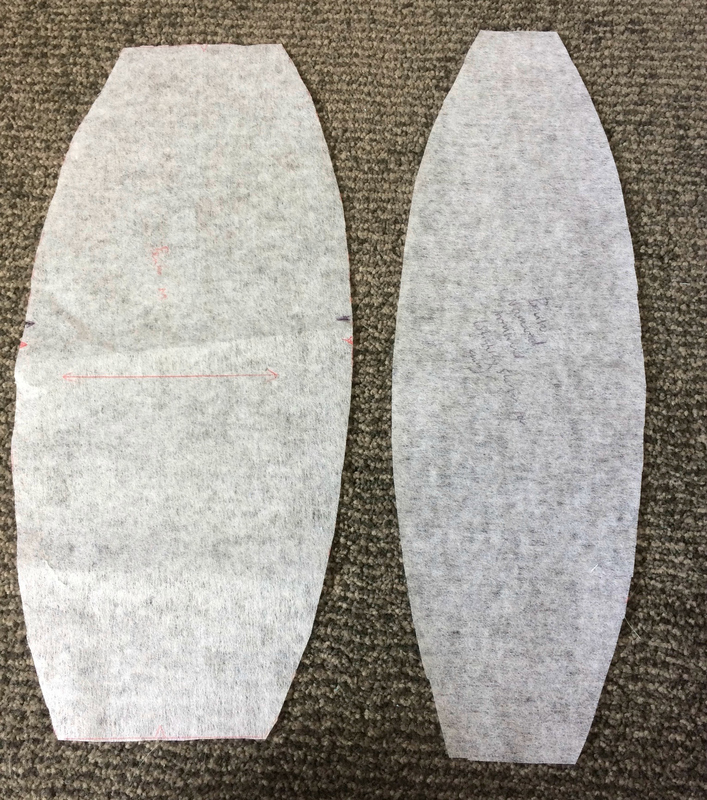 I then slashed horizontally across the approximate mid-point of the sleeve (about 12cm from the shoulder) and added 15cm in length to the front and back pieces (plus 30cm to the cuffs!) to create a very low armscye for side nursing access. One does of course need to wear a camisole or tank or bikini underneath to avoid flashing underwear! Due to the extra length, floppiness and weight of the cuffs I tacked them down in four spots around the armscye and they sit perfectly. I’m so thrilled with the result! So there you have my collection of Bentos. It’s a such a great pattern, and as you can see has great scope for style variation, and I’ve not even touched on the cute cross-body in-seam pocket variation! With a bit of imagination and inspiration sewing basics is definitely not boring! Great read Sarah, and this pattern really suits you. Is the Bento Tee pattern pretty much the same as Lisette B6182? The A view? Beverly, the Lisette top is a woven pattern with a center-front seam and darts, so it’s quite different. But a similar silhouette. The Bento Tee has an option for front pockets and/or color blocking as well.